Shorelines of stormwater ponds are prone to erosion because there are many forces working to undermine the stability of the bank. In many communities, property lines and HOA easements are drawn relative to the pond shore. The loss of shoreline is the same as moving the easement which reduces the useable real estate for the waterfront owner. Most communities consider it the responsibility of the property owner to manage the waterfront of the property, so stopping shoreline erosion is up to the homeowner but may be restricted by the HOA bylaws. This means that the HOA has to determine what shoreline management strategies it will allow the homeowner to use to prevent erosion of their property. The most significant erosional force at the shoreline is also the subtlest. The simple lapping of ripples and loosening of saturated soils pulls soil particles apart just below the water surface; therefore, much of the bank erosion is occurring below the water level where it goes unseen until the exposed part of the bank slumps. Stormwater ponds are also designed to fill and drain with each storm event. The repeated rise and fall of water creates currents that pull soils away from the bank. Of course, water enters stormwater ponds through pipes that convey water from the paved surfaces in the community. The inlets where these pipes discharge into the pond are subjected to concentrated flow that can erode deep gullies and holes and affect the adjacent banks. Finally, many ponds are designed to receive surface flow from grassy swales between houses. These swales receive water from the gutter downspouts and direct it over the lawn to the pond or to the street. These shallow swales concentrate sheet flow, which can create gullies and depressions as the water flows down the pond bank slope. Why are our banks eroding faster than the neighboring community? Bank Slope: The slope of the bank is the single most important factor that determines rate of erosion. Steep banks with slopes greater than 3 to 1 (3 feet of width for every foot in height) are almost certain to erode and undercut over time if they are not stabilized. Soil Type: The consistency of the soil also determines rate of erosion. Sandy soils have less structural integrity than soils made of clay. In the coastal plain (where the vast majority of South Carolina's stormwater ponds are located), soils consist of little or no natural rock and are often composed mostly of sand or clay. Fountains: Surface fountains agitate the water surface, creating more wave action. In most cases wave action dissipates before it reaches the bank, but ponds with large fountains or fountains that are located near the shore are likely to experience accelerated shoreline erosion. Nuisance Wildlife: Animals also cause erosion, especially when large numbers are confined to small ponds. Concentrations of ducks and geese are the most common destabilizers of pond banks because they eat shoreline vegetation and trample the bank. They also churn sediments near the bank as they sift for invertebrates in the mud. Another problematic animal is the muskrat because it burrows into the bank to make its den, and it consumes shoreline vegetation. Dens can collapse unexpectedly and create large holes in the bank slope. Lack of Protection: The most common way to manage shorelines in stormwater ponds is with turf grass that is mowed to the water's edge. This strategy provides very little structural integrity to the bank. Turf grass is not an aquatic plant, and its roots do not grow well in saturated soils. Turf grass will not send roots down below the water surface where the most significant erosion is taking place. As a result, pond banks with grass mowed to the edge are almost certain to undercut with time. What can I do to stop shoreline erosion? Although there is very little a community can do to change the bank slope or soil types around their ponds, there are significant improvements that a community can make to deal with the fountains, nuisance wildlife, and lack of protection that are accelerating shoreline erosion. Fountains: Stopping erosion caused by fountains is simple. Either move fountains to the center of the pond away from banks or consider replacing the fountains with other circulation systems (see section on Aeration and Circulation Systems). Diffuser systems do not agitate the water surface as much as fountains. Nuisance Wildlife: Unfortunately, dealing with nuisance wildlife that are causing bank erosion is not as simple as fountains. Stormwater ponds are suitable habitats for ducks and geese when residents are feeding the birds. When residents stop feeding ducks and geese, there normally are not enough food resources in residential communities to sustain large flocks of waterfowl, so the birds eventually move on. If waterfowl are persistent even if the community curtails all feeding, then it may be necessary to contact a nuisance wildlife control operator to have the birds trapped and removed (see section on Controlling Waterfowl). The only way to control muskrats in stormwater ponds is to have them trapped. Since muskrats are a fur bearing species, only licensed persons can trap and transport them (see section on Controlling Beavers and Muskrats). Protect the Shoreline: Pond shorelines can be stabilized using two general strategies: 1) emergent wetland plants or 2) artificial materials (such as rip-rap or bulkheads). Each has its advantages and disadvantages, which the community should consider carefully. How do I use plants to stabilize my pond bank? 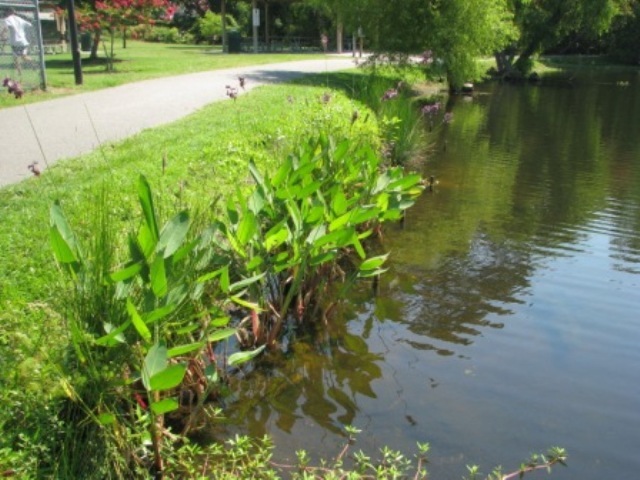 Wetland plants established on the shoreline are a preferred method for stabilizing pond banks, and they provide many benefits beyond erosion prevention. The deep, robust root systems of these plants bind soils in the area where the majority of erosion is occurring, just below the water surface. Unlike turf grass, these plants thrive in saturated soils. The main advantage of planting shoreline plants is that they provide other services such as filtering pollutants in runoff, absorbing nutrients that grow algae, trapping sediment and yard debris, deter nuisance wildlife, provide cover and forage for fish and invertebrates, and dampen wind and wave energy. For guidance on which plants to use for stormwater pond banks, consult the Shorescaping fact sheet. Why not use bulkheads to stop erosion? Bulkheads provide excellent erosion control if they are installed properly. The toe of a bulkhead needs to extend down into the pond bottom, the sides should be built with wing protection, and the top of the bulkhead needs to be anchored into the slope with a dead-man anchor. Without these measures, bulkheads are likely to breach and fall into the pond or to be undercut and erode from beneath and around the sides. (For design suggestions, refer to the Army Corps of Engineers Bulkheads & Seawalls). All waterfront owners must be aware that each stormwater pond basin is designed to be a very specific volume to meet storage requirements determined by local regulations according to the size of the pond's watershed. If waterfront owners begin building high bulkheads and back-filling behind them, they are reducing storage in the basin. If bulkheads are not regulated by the HOA and high bulkheads proliferate, then the community may be liable for damages incurred from downstream flooding because the community has chosen to alter the engineer's original design. If the community chooses to allow bulkheads, it must be very careful to preserve the storage capacity of the pond and also not impede flow. This is best done by requiring that bulkheads be no higher than a foot or two above normal pool. There is an easement around my pond. Does that affect what I can do to the shoreline? Many communities have established easements around ponds. Most commonly the easement extends up the bank 10 to 15 feet from the normal water line. In some cases this easement is merely for maintenance, and what goes on in the easement is determined by the HOA's bylaws. In other instances, the pond is owned/maintained by a municipality rather than an HOA, so it is important for homeowners to know the rules about activities in the easement and who has authority over those activities. Activities such as planting plants or building bulkheads may be restricted by the terms of the easement, and homeowners may be liable for damages and repairs for unpermitted activities in the easement. Nevertheless, the terms of easements can be changed if the community feels the need to do so. For HOAs, this may mean amending the bylaws to allow for shoreline plantings or bulkheads..